As I mentioned in my previous post, I was in Speyside a couple of weeks ago. My purpose for being there was to learn more about Chivas brothers and their single malt and blending operations. I would say that on this trip, the concentration was more on the blending operations, which is understandable. The majority of Scotch Whisky sold world wide is Blended Scotch Whisky. It is a real skill to blend whisky. 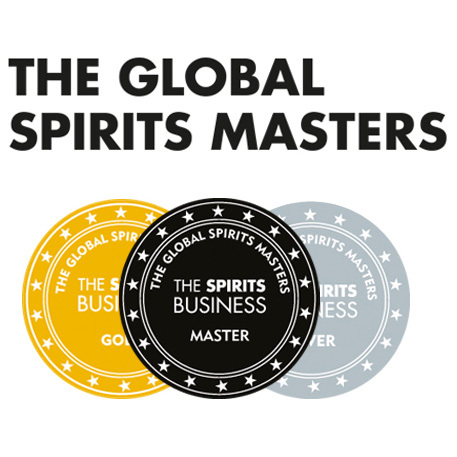 The quality control, inventory control and blending talent requires very dedicated people, very skilled nosers, very skilled recipe makers, very consistent distillers and finally a very consistent blender to create a worldclass product year on year. And I am not just being polite by saying that Ballantine’s is a World class product. In volume, they are only behind Johnnie Walker in terms of Worldwide sales. They are very highly rated by the masses, and I am yet to find a whisky geek (I am allowed to say it, I am one) who doesn’t like Ballantine’s. Sandy is obviously doing a good job! 1st day in Speyside. We had just been for a wander around Glenburgie Distillery. This is the footprint or base malt behind Ballantine’s Whisky (that and MiltonDuff Single Malt). We sat down in one of Sandy’s sampling rooms after the Glenburgie Tour. This is what I had been looking forward to. Talking to a Master Blender is always fascinating, as these are the guys (and girls) that are working with the liquid every day. 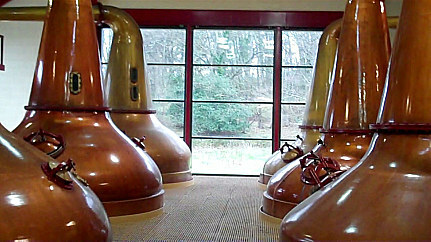 They are the ones dealing with the single malt and grain whisky every week and planning for the future. Before we got to discussions about blending, we nosed some of the components to Ballantine’s. Everything had been watered down to 20%, as this is the strength that Sandy noses at. 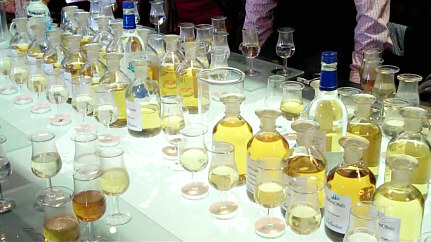 So after nosing some of the things that Sandy works with to create Ballantine’s, we got down to talking about blending. Sandy and his team will approve the distillate that has been made the previous week, before it goes to be filled to cask. This is for all the Chivas Distilleries. This spirit is rated from 1-5. 1 being unusable and something to go and check at the distillery (e.g a distillation fault) 5 being a perfect example of that new spirit. 3 being something different, but with potential. Between Sandy and his blending team, they will create Ballantine’s Finest samples and compare this to the standard or check sample. If it matches, then it gets the thumbs up. The pressure on getting every blended match right must be immense, as it is millions of pounds of stock ,bottling costs and transportation costs for every batch. Sandy is laying down stock for 30 years time. He may not even work with this stock. 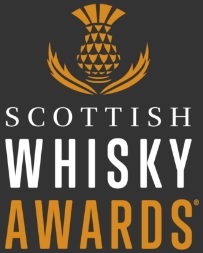 This kind of planning for the future is the mind boggling thing about the Whisky Industry. The inventories that Sandy has access to now show that 30 years ago, whisky companies laid down quite a bit of stock, which is brilliant for us as we reap the benefits now. This entry was posted	on Thursday, April 28th, 2011 at 1:48 pm	and is filed under Miscellaneous. You can follow any responses to this entry through the RSS 2.0 feed. Responses are currently closed, but you can trackback from your own site.